The software monitors computer activity on the internet, instant messaging, e-mail and other applications for inappropriate behaviour. If improper activity is detected, the programme stores details of the offending material for review. London Grid for Learning's (LGfL) e-safety software will benefit London's 2,600 maintained schools. 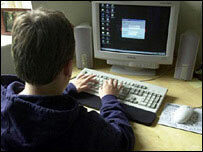 More than a third of 12 to 15-year-olds have faced some kind of cyber bullying, according to a government study. "This software enables all computer related activity to be tracked," said Brian Durrant, of LGfL. "Ultimately, it enables better protection of pupils from cyber-bullying and other inappropriate on-line activities," he said. The LGfL regroups London's 33 local authorities providing safe on-line services for all maintained schools.